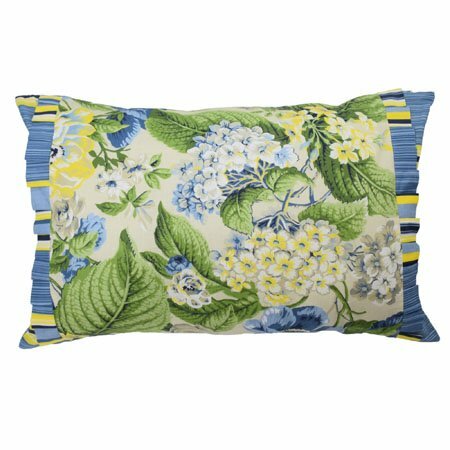 Floral Flourish 14x22 Decorative Pillow features a beautiful garden of blooms including hydrangeas and peonies in rich hues of blue, yellow, and light green on a clean and crisp ivory ground. A coordinating stripe appears at each end accented with a pleated ruffle. The pillow reverses to the coordinating stripe on the other side. Hidden zipper closure. 14" x 22". Spot clean only. 100% prewashed cotton.